Shad Harder receives his certificate as the Employee of the Quarter from committee co-chair Sabrina Wienholtz. Shad Harder always keeps an open eye for ways to improve library technology. In the last 15 years working for the Kraemer Family Library and the Office of Information Technology, he’s been behind a series of improvements geared to making it easier to access library services. Harder was the one who installed and maintains a new book scanner that makes it easier to access information for students with disabilities. He coordinated the maintenance of the copy machines, what may seem like a minor task, but can cause problems for students if there are issues at night or on the weekends. Harder even researched what kind of furniture students like the best when it comes to studying individually or as a group, and the best places to put that furniture, something outside of his role as an IT professional. 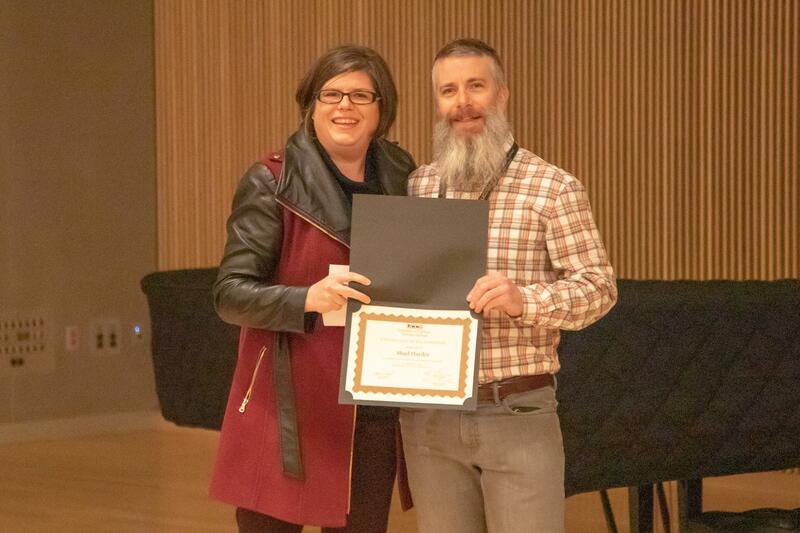 That commitment to detail, always with the focus on how small changes or new services can benefit students, is what led to his recognition as the UCCS Employee of the Quarter for October through December 2018. “Being a Colorado Springs native, it has been exciting to see, and to be a part, of what UCCS has become,” Harder said. Harder started working for OIT as a student employee and joined the staff full-time in 2004. While his position title has remained the same in the last 10 years, his responsibilities have grown and he’s coordinated more than six technology-related enhancements in the library in the last four years. He was part of the implementation of new collaboration tables that allow screen sharing and a Walltalker white board in the Library Instruction Lab. Eight years ago, Harder added the IT responsibility for the five Excel Centers to his job. As each center serves a specific purpose, each of the IT needs are different, but he has worked with the executive director and each of the center directors to implement and maintain those needs throughout the years. Harder also volunteers on campus with the UCCS Bicycle Advisory Committee and encourages sustainability in the library through the Library’s Team Green. He often participates with his colleagues in staff sports events. In recognition of his efforts, Harder will receive a $100 stipend, three months of a free and reserved parking space, a $40 voucher to the UCCS Bookstore and one day of administrative leave as part of the award. To nominate a staff member for the first quarter of 2019, visit the Staff Association’s nomination website. Congratulations Shad! Well deserved. We appreciate all that you do for UCCS!